Is there a difference between selling “to” the United States as opposed to selling “in”? In other words, if the seller is a foreign company and makes a sale to a US company, who then uses or re-sells the item – is by virtue of the sale the profits from the sale subject to the US corporate income tax? Or, if the foreign company never sets up a business in the US, but merely sells to US corporations, is that one way of shielding those profits from the US tax? If it’s the latter (and based on my experience I think it is), then your argument is somewhat misleading. Sure, Honda or Toyota with their US Divisions pay the corporate tax on sales that they make into the US, but their direct sales from Japan to the US (not going through their US operations – i.e. to re-sellers like Home Depot or Amazon) might not be subject to that tax. So there would be an advantage to VAT vs. non-VAT in that case. There even might be some room for gaming sales into the US – let their US divisions sell at a loss, with the sale into the US (e.g. from Honda, Japan to Honda, USA) being at a higher price than the cost of the sale inside the US – so Honda, USA runs at a loss but then gets influxes of funding from Honda, Japan. Not sure if that would be legal – but to the extent it is – the room for gaming is tremendous. And certainly sales of input goods – aluminum, steel, rubber, etc. – into the US wouldn’t seem to have the corporate tax on them. Honestly, I’m no fan of taxes on business profits at all – too much room for gaming. I think Ted Cruz’s plan of a VAT-like (but non-VAT)annualized tax on all business receipts, with a limited set of deductions, would be a much better way for the US to go. Save money on tax gaming, much lower, more standardized tax. 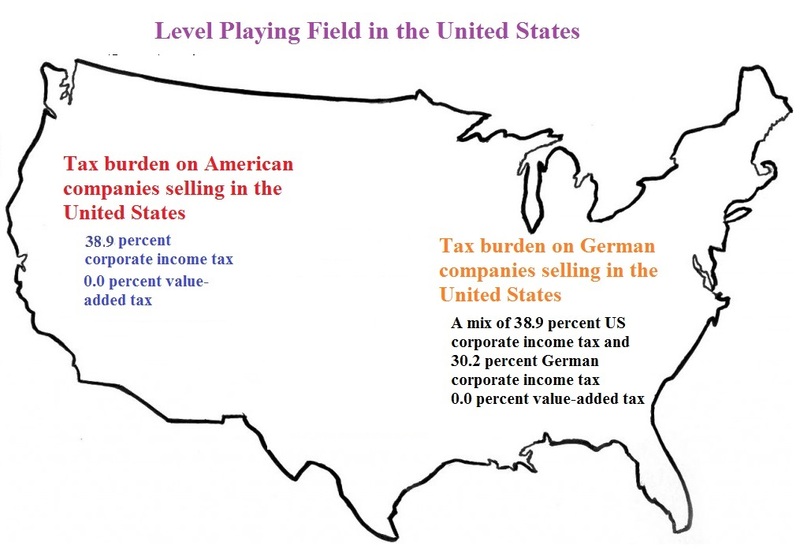 Plenty of U.S. cities have such taxes (e.g. Philadelphia). E.g. a 3-4% business receipts tax in place of the corporate tax, with the choice between a $500,000 in sales standard deduction and itemized deductions limited to: 1) wages for US labor (up to, say, $1M per employee to appease liberals a bit); 2) health care subsidies for US labor, up to a cap, say $15K per employee of subsidy – but maybe with a multiple for the deduction (1.5? 1.25?) to incentivize provision of health insurance; 3) retirement subsidies (with a similar cap and potential multiple on tax deduction to incentivize 401K matching, etc. ); and 4) 10 year depreciation of “permanent/hard” investments into the US (machinery, buildings, etc.). Maybe a couple more – but not much. It would also not exempt “not for profits” or “charities” – eliminating one more route for tax evasion. This would make things so much simpler than the current system, and simplicity in rules itself has powerful pro-growth implications…. Two lies in one sentence…. Congress can’t limit growth in entitlement spending (SS, Medicare, Medicaid, etc.) to 2%. And entitlement spending makes up 70% of the budget. Also, what they left out of the above is that limiting growth in outlays only balances the “Discretionary” portion of the budget. Hopefully one day Daniel will write an article addressing this false claim and the other big one; “Officialy” in FY 2016 (as reported by the news media) the National debt up only went up $578 billion while actually it went up some $1.4 Trillion as reported on the treasury website National Debt to the Penny !!!!! I think it’s consumers who ultimately pay VATs anyway, not businesses. It’s got nothing to do with favoring one countries products over another’s, consumption taxes are just a simple blanket approach to collecting tax revenues. Germany?? Why not China or Vietnam or Brazil. 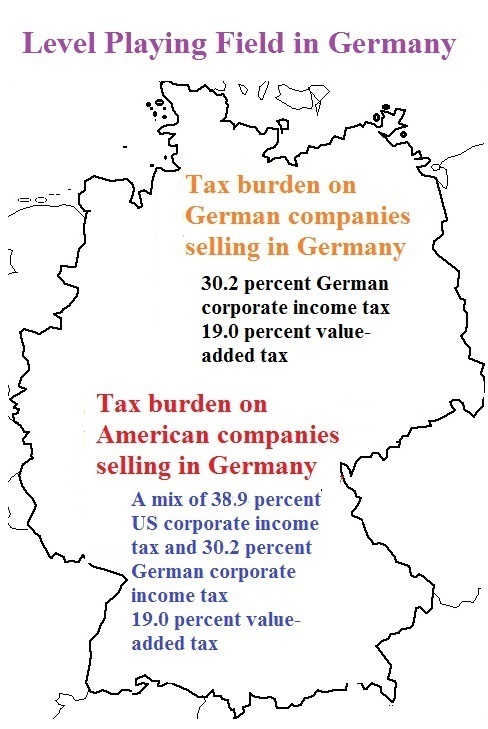 Germany has a federal corporate tax rate of 15 % plus 5.5 % of those 15 % (that would be about .9 %) as a special tax to finance certain costs associated with Germany’s reunification. It sums up to roughly 15.9 %. So what about the 30.2 % mentioned in the article? Local municipalities (cities, towns and sometimes counties) can add a local corporate tax in addition to the federal corporate tax. Obviously the tax rate can vary widely from town to town (actually the highest local corporate tax is 4.5 times higher than the lowest one). So 30.2 % is just an overall average. German companies can influence their corporate tax burden significantly by choosing the right place for their HQ and production sites. VAT laws are the same in all EU member countries. But the VAT rate varies from country to country. Germany has a general VAT rate of 19 %. But a long list of goods and services fall into another category. Most notably most food products as well as printed goods (books, newspapers, magazines, but not ebooks) are taxed 7 % VAT. Certain other things like medical services provided by doctors or banking services are not taxed at all. Unlike in the U.S. all consumer prices in Germany are gross. They already contain VAT. As a consumer you see on the label the price including VAT. Comfortable but also a good way to hide taxes from the mind of the consumer. B2B deals on the other hand are always net. Prices do not include VAT. Nevertheless the business customer has to pay VAT. When a business uses the aquired goods and services for their business it will get refunded the payed VAT by the German IRS. The goal is that only a private consumer at the end of the supply chain actually pays the VAT.